Internet services on board are expanding on commercial airlines domestic and international. For many businessmen, these services should be highly appreciated, since the long time flight would be no more the �gblind time�h during business trip. Popularization of in-flight Internet service will be the bright news for satellite communication industries that experienced the serious depression in the last few years. 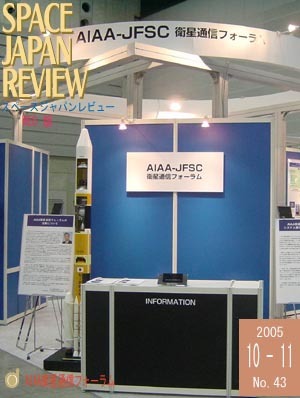 SPACE JAPAN REVIEW magazine introduced the summary of services by Connexion by Boeing(CBB), pioneer and promoter of in-flight internet service, in October/November 2004 issue. This time, CBB total system architecture and the latest status of service deployment will be addressed. The Japan Aerospace Exploration Agency (JAXA) announced a long-term vision for the next 20 years in April 2005. The details of the vision can be obtained at the JAXA�fs homepage (http://www.jaxa.jp). A brief introduction is given with key words here. This document reports the AIAA TCCS (Technical Committee on Communications Systems) meeting, held in the night of the first day during the Joint Conference of 11th Ka Band and Broadband Conference and 26th AIAA International Communications Satellite Systems Conference (ICSSC-2005) which was held in Rome on September 25-28, 2005. After an accident of the Space Shuttle "Colombia" in January 2002, STS-114 of the Space Shuttle "Discovery" which had been prepared for the Return-To-Flight was launched successfully on July 26, 2005 and returned to the ground safely on August 9, 2005. A Japanese Astronaut Noguchi performed three times of extravehicular activity (EVA) successfully during the shuttle mission. I stayed as one of JAXA support group members from its launching to the return in the U.S., and had a very valuable experience through this activity. At first I would like to thank people concerned particularly.